Sihanoukville is a seaside town in Cambodia known for its nice beaches. We travelled often to Sihanoukville when we lived in Cambodia. One day we walked pass a school yard where kids where having fun. I took these photos in 2001 or 2002. I do not remember well. They have a low exposure. They were the first days of digital cameras and i remember having a memory card of just few Mb. I was in Kampot. in the South of Cambodia, for a language course. It was the beginning of the forus years I spent in Cambodia my family. Last Sunday I went for an afternoon walk to Santa Lucia. It is a small village about 15 km out of Tegucigalpa. There was a nice bright light. The sun was shining, but it was not too hot. Families were in restaurants having lunch and enjoying the good time together. It was a nice day. The end of February is the nicest part of winter. All of a sudden the days are longer. They get also colder, well below zero. This means that the snow does not melt and the lake gets covered with ice. It is possible to take long walks on tracks which do not exist for the rest of the year. Get to new spots to take photos and enjoy the beauty of this season. I have been living in Southeast Asia for the last 15 years. Now I am back in Europe and it is lovely to feel the winter again here in Finland. With the first snow it was to take a walk along the path behind our house and capture the Nordic winter atmosphere. The photo is taken with the Panasonic G85, handheld. The lens is the Panasonic Lumix 25mmm f1.7. It has been snowing earlier than usual this year here in Tampere. It was nice to walk on the path behind our house and take some photos of the snow paths. I took this photo handheld with the Panasonic G85. The lens is the Panasonic 25mm f1.7. 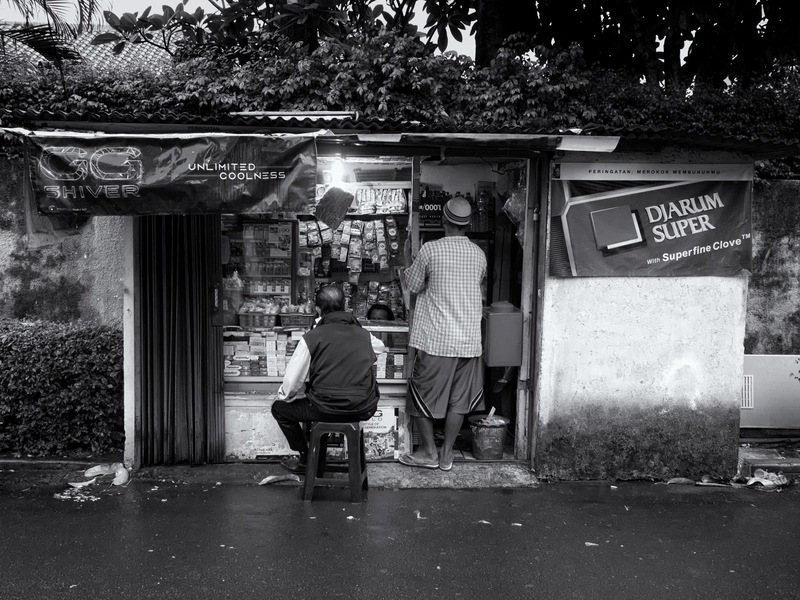 Every neighborough in Jakarta has these small shops down the road where one can run to and buy mobile phone credits (pulsa), a soft drink, the three in one powder mix to prepare a milk coffee. The shop in the photo is down our road. It is family run. Open from early morning to late evening seven days a week. In Jakarta, in Kemang Timur, there is Vespa repair show. 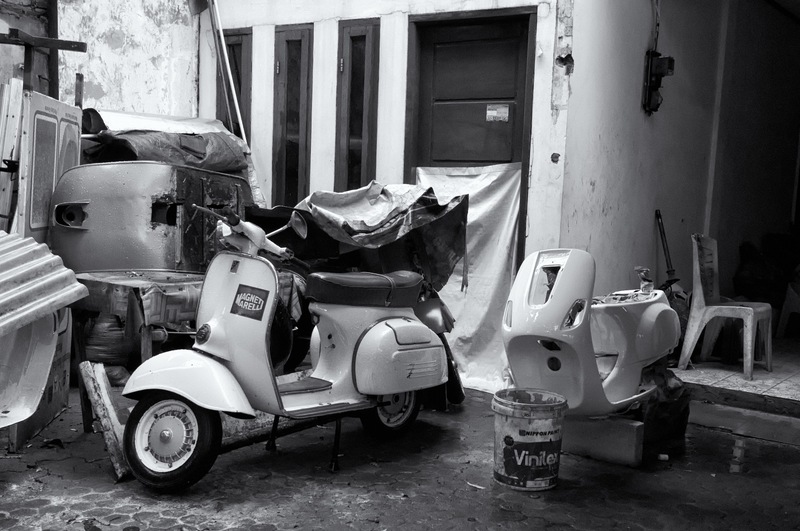 Actually, it is not a repair shop, it is a workshop where old Vespa piece are repaired and put together to give a new life to these wonderful and old motorbikes. When I walked by the workshop I stopped to listen to the noise from inside and the smell of the paint use for the main frame of a white Vespa. There are few of these workshops in tow and several Vespa clubs, one of them is even called Pontedera! It is a long rainy season this year in Jakarta. When rain starts these young men appear next to the door of the office tower where I work. It happens all over the city. They appear and accompany under their umbrella the people who need to walk to the near coffee place, the motorbikes parking, of into a taxi. There si no negotiation on the price. A silent agreement. People just know how much to give them. There are many guards in Jakarta. They work at the gate of housing compounds, the entrance of office tower, at the malls and at some less known place like a music school in South Jakarta. They have long shift and sometime really need to take a break, if just for a moment. For the last three years I have been cycling to work here in Jakarta. On my way to the office I have to walk across a pedestrian bridge over one of the stations of the Transjakarta bus line, Halte Senayan. A year or so ago I started to carry my camera and take photos from the bridge as well as under the bridge. 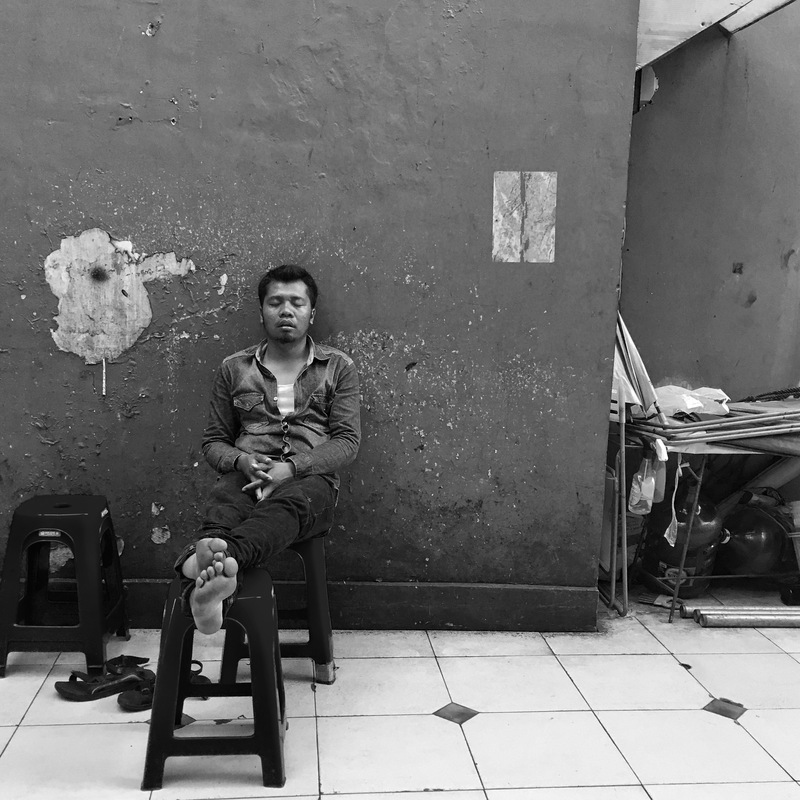 Having the camera with me and taking photos every day has made me discover all what is going on here every day: the people commuting to work, the food sellers, the crowded minibuses Kopaja, the motorbikes drivers, the musicians, the workers at new Jakarta underground system. When I was walking pass Halte Senayan without my camera I missed most of that. I did not notice it. I was thinking about the day ahead, the meetings, the emails, etc. The pedestrian bridge and Halte Senayan was unremarkable, because I did not noticed all what is there. Having the camera with me was like opening my eyes to a place I am go through everyday, twice a day. Discovering it in a new way. Here some of the photos I have taken so far. In the morning the rush to the office towers where they work. They spent maybe an hour, an hour and half, maybe two hours on the road to commute and to get here. They now rush to be on time at their workplaces. Jalan Sudirman is a major roads that links south Jakarta to the center of the city. In the mornings at the rush hour the traffic moves slowly. Busses, cars, motorbikes. Near the pedestrian bridge I cross every day, I often see this man who is on duty and keeps the sides of the road clean. Here he was walking south, having a moment for himself. 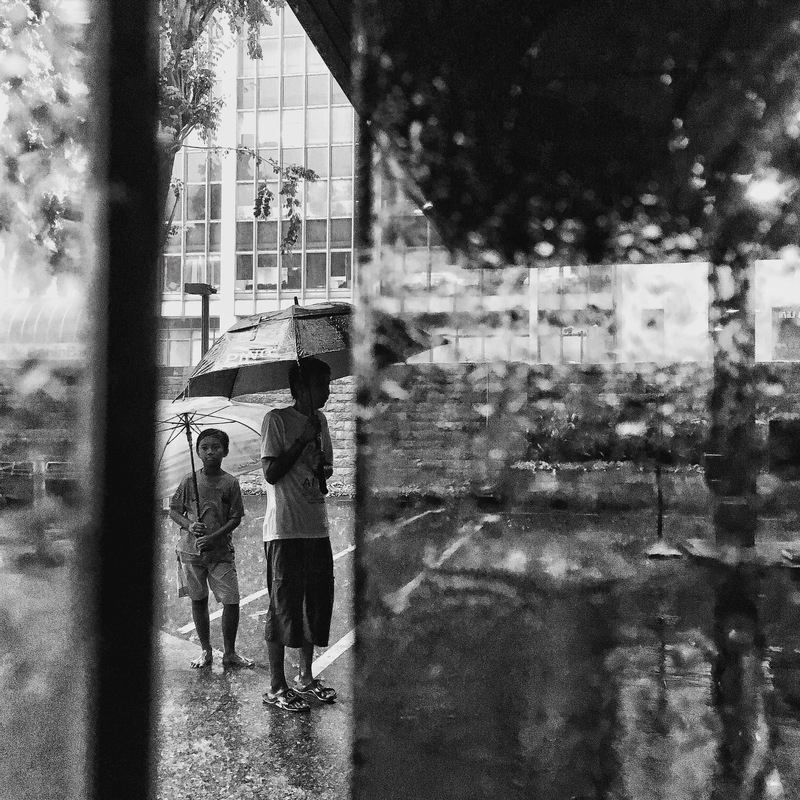 I took these photos on a Sunday morning, the day after a very heavy downpour that hit Jakarta. It rained very heavily and for a few hours. The lower parts of the city, like this kampung (urban village) in the Kemang area got flooded. It does get flooded at every strong rain, but the one that hit Jakarta a couple of weekends ago was particularly strong. The day after I found people who were tired after a long night spent drying the lower floors of the their houses and rescuing furnitures. I talked with them about the challenge of living with frequent flooding in this area and how things have changed little during the last few years. Few days ago I posted this photo on Instagram. A friend, who is following my account, then sent me a questions in the comments section: how do I deal with ethics in my street photography. Good question. Over the years, I have been reading a lot about street photography: the beauty of black & white photography, street photography techniques, the best cameras and lenses, and, last but not least, blogs where professional and amateur street photographers wrote about their do and don’t in street photography. One blog that I remember more vividly is the one by Lilly Schwartz . In one of her blog post she lists the rules she follows when taking photographs of strangers in the street. During the last few days I have been re-thinking what I consider right or wrong in doing street photography. While there is a great degree of subjectivity on which rules we apply to ourselves, I think that above those subjective rules there is (at least for me) a more universal rule which is about respect to others and of ‘not doing harm’ when taking photos of people in the streets. The specific rules that I have for myself and which I try to follow come under this general principle and are subjective in the sense that they are shaped and defined by the values I have been given through my education and upbringing, my own character and what I feel comfortable to do (and not to do) . 1. I never take a picture of homeless people of any age. Not even by asking them whether I can. I just do not do it. It does not feel right to me. I did it once, about 10 years ago while walking in the street of Old Delhi near the Red Fort. The moment I took the photo, I knew I was doing something wrong. I have not done it ever since. 2. I ask, whenever possible, if I can to take a photo of someone. Here in Jakarta I speak enough Bahasa Indonesia to have a chat and ask if I can take a photo. Most of the times the people I meet are happy for me taking a photo of them and showing them the result on the LCD screen. People often ask me to take their picture particularly when they are in a group. If someone says no; no problem. A smile, an apology, and all is good. 3. There are cases like the photo above where I cannot ask permission to take the photo. The man was on a bus moving quickly along a busy road in Jakarta. However, I do not feel I am stealing something. My aim is document the common everyday life of people living in cities. I am not a professional photographer and do not make money out of the photos I take. I share my photos through my blog and social media as a way to share with a larger community a moment, a split second that for a reason or another I felt was worth capturing to contribute to telling a story that is unfolding every day, every hour, every minute in a city. 4. If a person has second thoughts and ask me to delete the photo I can do it in front of their eyes showing the LCD screen. However, this is not happened to me yet. 5. I tend not to use telephoto lenses for street photography. I usually take photos with a 35mm equivalent or a 50mm equivalent lens. This means that people do notice me and it is easier to ask for permission. I would use a zoom to take a photo of a crowded place from a distant view point. 6. I only take pictures of children when they play happily or together with their parents. Again, thank you to my friend for asking what rules I follow for my street photography which has made me to write this blog.